Connie Timpson is Vice President of Instruction for the Southeast Region. She is based in Jacksonville, Florida, but she also facilitates team building events in Orlando, Tampa, Miami, Ft Lauderdale, Atlanta, and other Southeastern cities. The National Commission on Certification of Physician Assistants, or NCCPA broke from meetings and exams in Annapolis, Maryland, to create Rescue Bears team building event for sick kids, and in a fun way, learn how to work with different personalities. These folks are the nice guys who assist your main physician. They specialize in everything from spine to obstetrics. Today they laughed while learning about different personalities, and dressing some cuddly bears like they normally dress – in scrubs with masks. These cuties will go to ailing kids in the Washington DC area at the Anne Arundel Medical Center. There, the Child Life Specialist will take over. Remember when you were four or five – a lot of things were scary. One of the biggest, baddest, scariest things for a child, is being hospitalized. Even the doctors who are there to help them get well, may seem like giants wearing masks. These cuddly animals will be there to rescue the child. NCCPA folks learned about themselves and each other. What makes each personality type unique, and how they relate to each other. 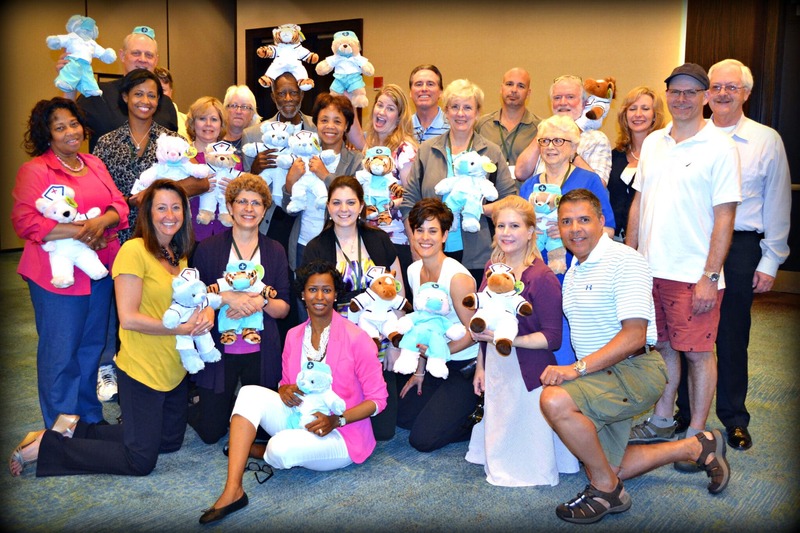 As they learned, and laughed, they stuffed and dressed “Rescue Bears” for children who really need rescuing, a gentle hug from a little friend, dressed in his “Physician’s Assistant” best.